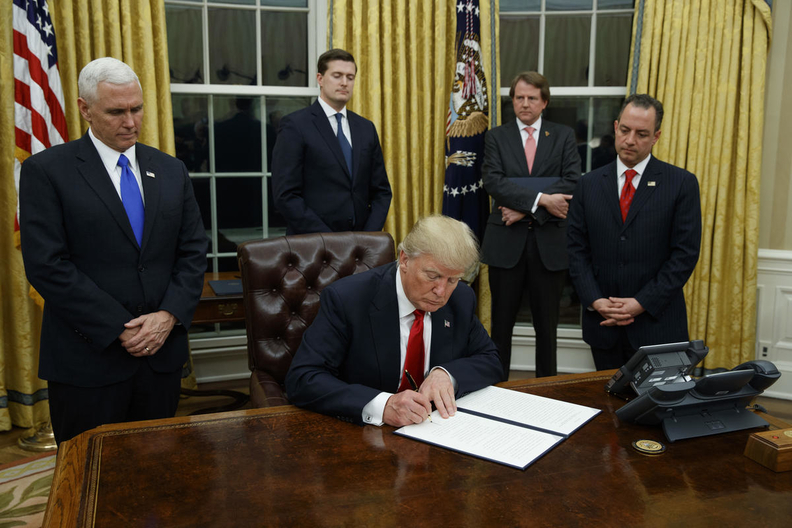 President Donald Trump's executive order Friday evening instructing federal agencies to go as far as they legally can to roll back the Affordable Care Act was not exactly surprising. He was expected to take some type of swift administrative action to signal his determination to repeal the law. But the order—along with Trump senior adviser Kellyanne Conway's statement Sunday that Trump may stop enforcing the law's tax penalty against people who don't buy insurance—has rattled insurers and health policy experts. They warn that effectively gutting the mandate—or even suggesting to consumers that they won't face any penalty for not buying coverage—could unravel the individual insurance market and prompt insurers not to offer plans in 2018. That could lead to 20 million Americans losing coverage next year. It's possible that facilitating the ACA's collapse is Trump's goal. He tweeted earlier this month that Republicans should let Obamacare “fall of its own weight” and make “the Dems own the failed Obamacare disaster.” If he and the GOP can convince the public that the law unraveled on its own, that would make their job of repealing and replacing it politically easier. Others speculate that Trump's purpose was to make a strong symbolic statement about his commitment to kill the law and buy time with his anti-Obamacare political base to come up with a plan to replace the law's coverage. While congressional Republicans passed a budget blueprint this month to wipe out most of the law, they and the administration are far from coming together around an alternative model. "The beneficial impact of this executive order is it gives Congress a little more breathing space to come up with something better than: Let's just destroy the market,” said Tim Jost, a law professor emeritus at Washington and Lee University who supports the ACA. That language suggests that the administration could ease up on the Obama administration's guidance and enforcement actions relating to ACA provisions in many different areas. For example, the Trump administration could make it easier for states to apply for innovation waivers under Section 1332 of the ACA, allowing them to design their own alternative coverage models. It's also widely expected that the administration will give Republican-led states greater leeway to impose cost-sharing rules, work requirements and other personal-responsibility features in their Medicaid expansion programs for low-income adults. The order recognized, however, that in revising regulations, agency heads must comply with the lengthy notice-and-comment requirements of the Administrative Procedure Act. Changes in Medicaid programs, for instance, require states to file waiver applications that must go through notice, public hearing and comment periods that can take months. She also said the law's requirement that employers with more than 50 full-time workers offer affordable coverage to them would end. “We're doing away with this Obamacare penalty,” she said. “This tax has been … a burden on many small business owners." Halting enforcement of the mandate penalties likely would run into legal roadblocks. The individual and employer mandates are explicit provisions of the law passed by Congress, and they cannot be overridden by the executive branch. Both Connolly and Jost predicted supporters of the law would file lawsuits challenging any executive actions to halt enforcement of the law's provisions. ACA opponents repeatedly filed suit—with some notable successes such as on Medicaid expansion—to block ACA provisions and challenge the Obama administration's implementation of the law. Now the tables may be turned. But Connolly said Trump's executive order does not address the key issues that will determine whether insurers remain in the individual market in 2018. Those include continuing to offer adequate premium subsidies to make coverage affordable, funding payments to insurers for the law's cost-sharing reductions for low-income enrollees—which House Republicans have sued to block—and providing adequate financial risk protections for insurers that sign up sicker patients.